Excavations in Bone Passage are now underway and Trench 6 continues to produce a wide range of archaeological material. Read on for more details. Excavations in Bone Passage, High Pasture Cave, continue to produce a wide range of well preserved artefacts and ecofacts. The sediments deposited in the passage contain animal and fish bone, shellfish remains, charred plant remains, charcoal and fire-cracked stone. This material will assist us in putting together a picture of the activities carried out at the High Pastures site during the Late Bronze Age and Iron Age periods, and the resources that were exploited. Animal bone includes pig, deer and cattle, while a few bone elements may also be from sheep or goat. We are also finding large amounts of charred cereal grain during the wet sieving operations at the surface, most of which appears to be barley. Shellfish remains include mussel, oyster, king scallop, periwinkle and limpet, indicating that gathering on the local beach of Camas Malag was also taking place. We are now putting together a fine assemblage of red deer antler, much of which shows evidence of working (tool and cut marks). Finished items are also been recovered from Trench 6 including the possible handle above. 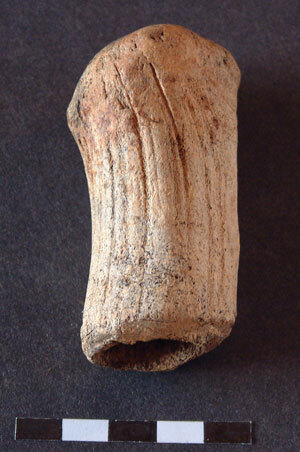 This has been manufactured from red deer antler, a section of beam immediately above the crown. The burr has been removed and shaping and smoothing has formed a rounded end, while a cylindrical hole has been bored into the opposite end. 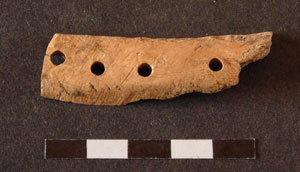 The bone plate shown above comprises a possibly sawn piece of antler that has been shaped and bored through with four small holes. Similar artefacts were recovered from Bone Passage last year, some with bone pegs still in place. At first we thought these plates were a type of knife handle, but the length of the bone pins precludes this and it is has been suggested that they may be some form of decorative embellishment for a wooden item. Other bone items recovered include a pin and several pieces of antler strip that have been shaped into an oval cross-section. The excavation of Trench 6 has also produced a wide range of pottery sherds and while they represent several different types of vessel, several pieces refit to the same pot. We have recovered at least three sherds of the pot shown above, while an additional five sherds were recovered from Bone Passage during 2004. 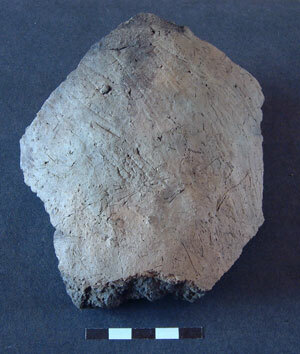 The sherd above is from a globular style of pot, which has a decorated applied cordon. 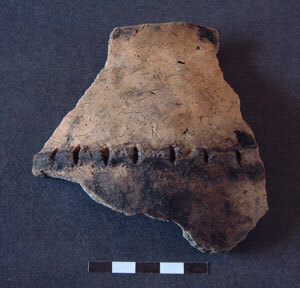 The sherd below is from a much thicker walled vessel that has comb decoration on its outer surface. The comb decoration comprises a series of abstract lines and grooves, some of which are parallel and converge on each other. This form of decoration is very similar in style to the carved grooves identified on the limestone block recovered from Trench 3 (see the last entry in the Finds Page). By the end of last week we had recovered at least six different sherds from this large pot, including the intact base, several of which refit together. The image below shows three of the larger sherds refitted. 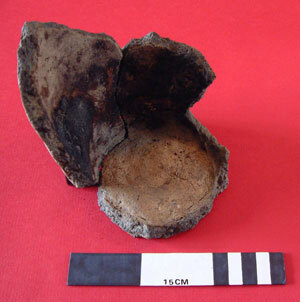 The dark patches on the inside of the pot are burnt residues that derive from the material last cooked in the pot. We hope to analyse these deposits during the post excavation phase of the project. 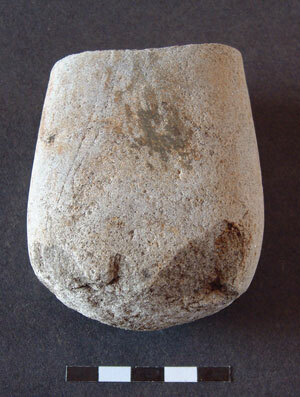 Finally, the excavations have also produced three stone tools. These include two pebble hammers that have received only limited wear, while a tool made from a quartz pebble appears to have been used as a crushing or grinding tool (see below). This finds page will be updated on a regular basis, so revisit the website again soon to see what we have found. WELL DONE GEORGE AND COLLEAGUES ! WISH WE COULD JOIN IN THE EXCITEMENT BUT WE ARE IN EDINBURGH ALL NEXT WEEK. SEE YOU ON SKYE SOON.